This is the second TA-082 you show! 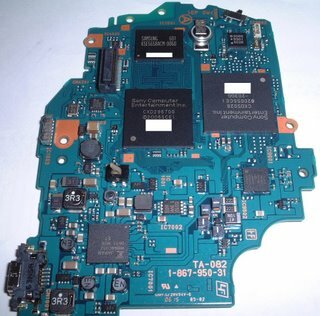 What firmware version are these PCB's as sold? Are they boxcode I=2.60 or H=2.50? My made in china PSP-1000CW was H, and TA-081. The TA-081 was used from at least from 2.00 up to 2.50 obviously. Boxcode F,H. I do not know if TA-081 was ever produced with firmware 1.52 or lower. FACT is that firmware 1.50 runs on TA-081. Thanks! So it looks that box codes up to and including H are 2.5/3.0V. Do you think that the AK8PSP1001B2 or AK8PSP1001B at the FCC site have TA-082 or lower PCB? I do not have a foto from downside TA-082. Maybe (probably) up to now, june 10, 2006, the TA-082 is NOT available in US.